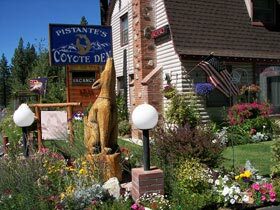 The Pistante's Coyote Den, located in South Lake Tahoe, works to maintain a clean, safe, family oriented, pet friendly motel. 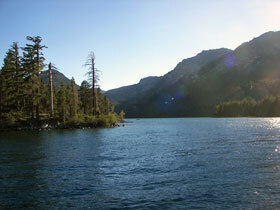 We have 16 lodging units to offer with a hot tub & gazebo under the Pine Trees; along with a picnic area and BBQ stove. Here at the Coyote Den we offer free wireless Internet and cable TV/HBO. breakfast in the morning and fresh baked cookies, coffee and tea in the evening. Coyote Den is perfect for any vacation accommodations that you may need. 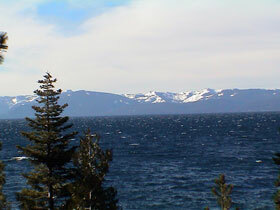 We also provide excellent lodging for wedding parties, anniversaries, family reunions, or any other group parties you may have in the Lake Tahoe area. Please visit the rest of our site for the theme room page with photos and rates. Browse our dog guest information page.. and of course our directions and map to find us!! Our lobby, Hot Tub, and Picnick Area!!!!! Contact Lorraine & Earl Pistante at Coyote Den Motel.